We're looking for a talented Developer Support Engineer to join our amazing and unique Developer Support team! Work with our smart and fun dev-support engineers to provide one of the best customer support experience in the industry. 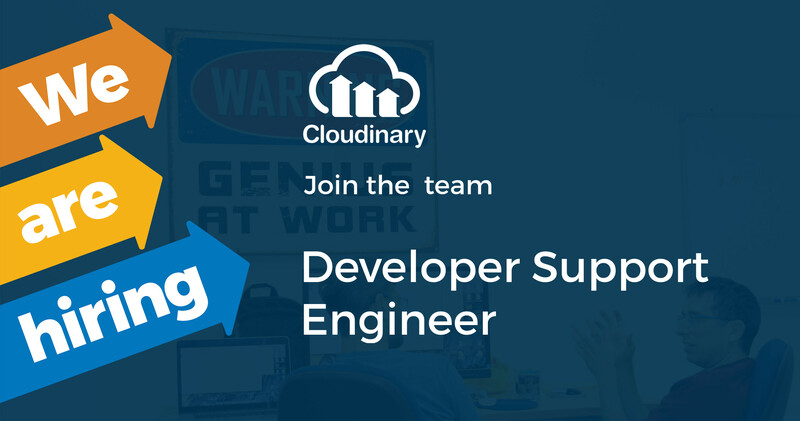 Enjoy a dynamic work environment from helping customers integrate our API cloud-based products in a variety of Web and Mobile development frameworks to contributing code to Cloudinary’s SDKs to advocate Cloudinary on local and global conferences and events. You would be part of our Customer Success team and would be focused on helping our customers streamline technical integration efforts. The ideal candidate would have a web and/or mobile development background and be comfortable in a customer-facing position. * Also possible as a part-time position (60% + flexible hours) for excellent students in their last year of a Computer Science degree. Respond to customers' (mainly developers) technical support requests and feature-related questions. Debug customer issues and create reproducible test cases for engineers to resolve. Handle code-related queries. Write code samples in multiple development frameworks. Maintain ownership of support cases until resolution. Monitor and answer on different support channels: ticketing system, public forums, social networks and more. Help enhance documentation to minimize repeating support issues. Coordinate with the different teams: dev team, product management, Account Managers, and others. Contribute code to Cloudinary SDKs. Help the dev team review new features and client libraries. Become a subject matter expert in Cloudinary’s technology. Support occasional high priority customer requests outside regular working hours. Hands-On coding experience, preferably in a web/mobile environment. Experience in a customer-facing position, preferably developers-support. Quick learner with a desire to learn new development languages and tools. Perfect English skills (verbal and written) with outstanding interpersonal skills.